Are you ready to discover how creative you really are? Come play at the Studio! Check out the Schedule of what's currently being offered and connect with me to register. The circle that we create in these workshops becomes a very safe container of support and love. It is a nurturing and sacred space for you to share intimately, be vulnerable, have fun, be creative, play, grow and YES... laugh a lot! You will have the space to explore the full and unique kaleidoscope of YOU – the Creative Genius that you are! Tapping into our Creative Self Expression thru Expressive Art fosters a sense of possibility, a way to shift your fears and beliefs about yourself and the world. Creativity is a portal of change, and it helps you choose how you relate to the world, especially right now, when fear, contraction, anger and turmoil are being activated..
Creative expression gives you information and direction that you may not be able to receive cognitively. Einstein said: “We cannot solve our problems with the same thinking we used when we created them.” By tapping your creative source, you learn how to transform your consciousness through self-expression, painting, sounds, movement and poetry. You come to know yourself more fully and deeply, and access the intuitive powers within you to heal, nurture your soul, and experience major breakthroughs while having FUN and PLAY along the way! Is it any wonder that often the times we feel most alive, are moments of PLAY? When we play, we are engaged in the purest expression of our human nature, the truest expression of our individuality.Play heals, transforms, and awakens us to our pure Joy, our natural state of being. It is not just something we do on the side it is a Way of Being. While it’s easy to be lured into the adult world of over-thinking, over-doing, striving, perfecting and needing to do things “right” ….or saying, “There is no time for PLAY as I won’t get anything done” , play actually relieves stress, improves connection with others, and assists in keeping you young and energetic. Every point of the scientific compass demonstratesthat play is a profound biological process which helps improves brain function and boost creativity. It’s less about scheduling time to play and more about allowing yourself to be Playful in this very moment .Therefore, every moment becomes a playful moment. This means letting go of pre-conceived plans and habits, and being willing to make “mistakes” while playfully stumbling towards new discoveries. It also means being able to let go of KNOWING where it’s all going. Einstein said: “We cannot solve our problems with the same thinking we used when we created them.” By tapping your creative source, you learn how to transform your consciousness through self-expression, painting, sounds, movement and poetry. You come to know yourself more fully and deeply, and access the intuitive powers within you to heal, nurture your soul, and experience major breakthroughs while having FUN and PLAY along the way! There is nothing like painting BIG! In this workshop you will be able to spend some uninterrupted time expressing yourself freely, brush in hand, painting your heart out, getting lost in the timelessness of your own inner creative world, and the deliciousness of simply putting color, shapes and images onto a BIG Painting. You will be introduced to a theme for the session, and taken through a process that will assist you in getting out of your own way enough, so that you can create with joy and freedom. And, you will be a part of sacred circle that will assist in creating a safe environment for your creativity to soar! In this first workshop we will begin identifying your inner compass through multiple sensory experiences including, sound, movement and creative expression mediums. You will practice being present, identifying which voice is speaking and dissolving the stories that bind and keep you from your heart’s calling. You will come away with a grounded sense of being able to access your inner wisdom and ways to continue cultivating that relationship in your everyday life. In this second workshop in our series, we will continue cultivating the relationship with your inner compass as you explore new ways to nourish and acknowledge your divine wisdom. You will develop the dialogue that resonates with your creative genius, creating a manifesto, which assists you in staying in the magnificent current of your inner compass. In this final workshop of this series you will integrate the sacred compass in day-to-day life. You will experience going past the noise, calling forward your inner wisdom and taking a stand. You will come away knowing you are anchored in your inner compass no matter what is going on in your world and will create a healing symbol to assist you in always remembering your inner truth. There is always a time to give thanks and turn our attention to our blessings to what we are grateful for, and preparing for what is to come. This 4-week workshop is design to slow you down, bring you present into the sacred & divine within you. You will have an opportunity to bring your deepest heartfelt prayers, intentions and blessings into art making. 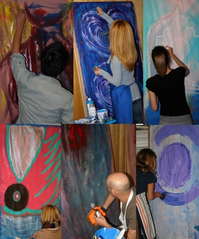 We will be using a method called Expressive Art, that will lead you into the still small voice of Spirit within. Art can be a conduit for Spirit... a way to go inside, listen, gain revelations, inspirations and new directions. In this Special Introductory Expressive Art workshop, you will have the opportunity to transform your relationship with your Inner Critic, Ignite your Spirit and fire up your Creative expression. spontaneous creation tells you exactly what you need to know for your growth in the moment, and can assist you in taking your next steps toward your heartfelt dreams. Creation without pre-planning provides a safe container to go beyond the inner critics voice and opens to the freedom of creative possibilities. 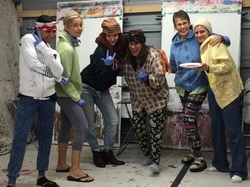 This unique one-of-a-kind workshop, is a chance for you to get hands-on experience of Expressive Art, and the work we do at Playful Art Studio. and use it as a gateway into your greater expressive freedom. Will it be the image of one of the many masks you wear in day-to-day life? Or perhaps you'll wish to create a representation of the face behind all of your day-to-day masks. Maybe your mask will be an image of the you that others rarely get to see. You may decide to reveal your unadulterated self by creating a reflection that depicts an image of the authentic, unbridled, exuberant, creative YOU! We will be using a variety of Expressive Art modalities to assist you in exploring and creating an image that could inspire you into more expressive freedom in your day-to-day life. Come spend a full weekend all for you--to revive, self-nurture and reclaim your CREATIVE SELF! Awaken and nourish your creative spirit by immersing yourself in two days of exploration, expression, play and FUN! 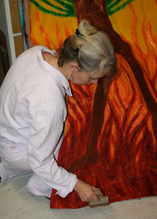 This is an Expressive Art retreat in deepening your intuition and your wild sense of knowing. This is an adventure into exploring YOU thru a variety of Expressive Art modalities, including intuitive painting, collage, sound, movement, and poetry.